This alien lizard continues to expand its range in California. Black dots on the map indicate a place where Mediterranean Geckos have been seen. They might not be established in all of these areas. These are just the locations that I know about. There are probably more. 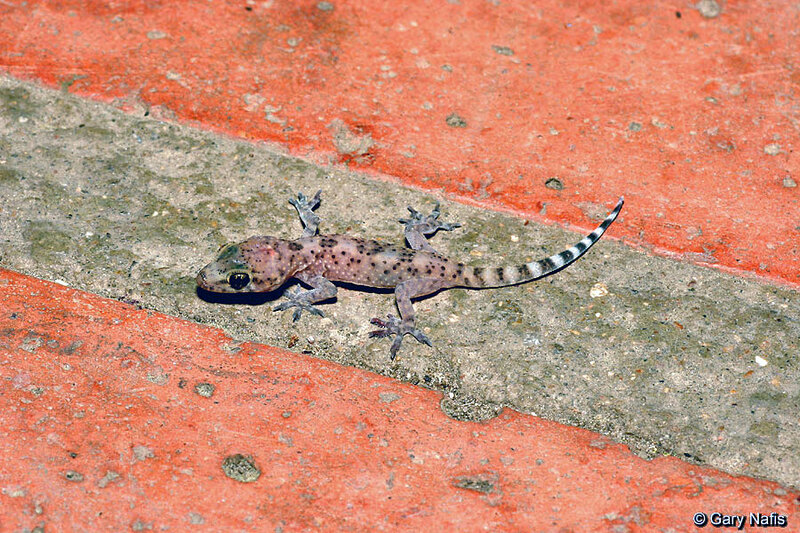 If you know a location where this gecko has been found that is not shown on the map or if you see a lizard that looks like this one anywhere in California that is not shown on this map, please email me at grynaf@yahoo.com and send a picture if you can for verification. Adult, Azusa, Los Angeles County Sub adult, Ocotillo, Imperial County Adult, Ocotillo, Imperial County. Adult, Fresno County © Patrick Briggs Adult, Sacramento, Sacramento County, found active in mid winter. tongue when it licks its lips after eating a flying insect. 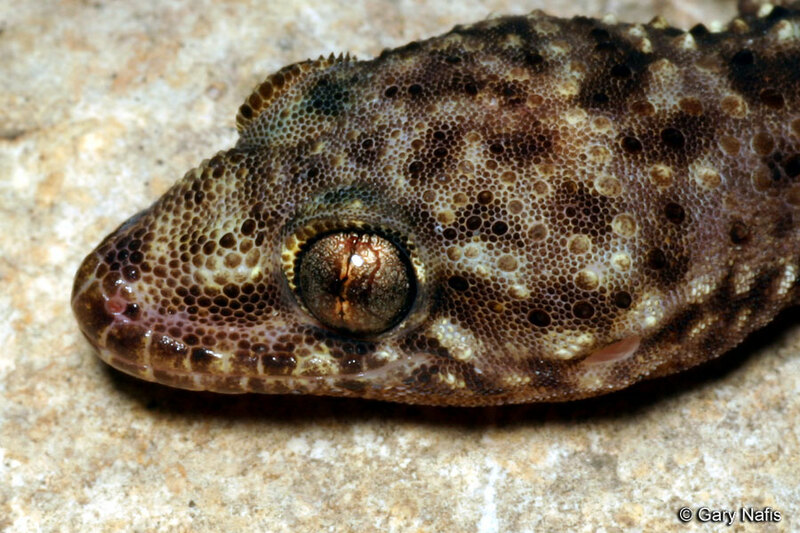 Mediterranean Geckos have soft skin with prominent knob-like tubercles. 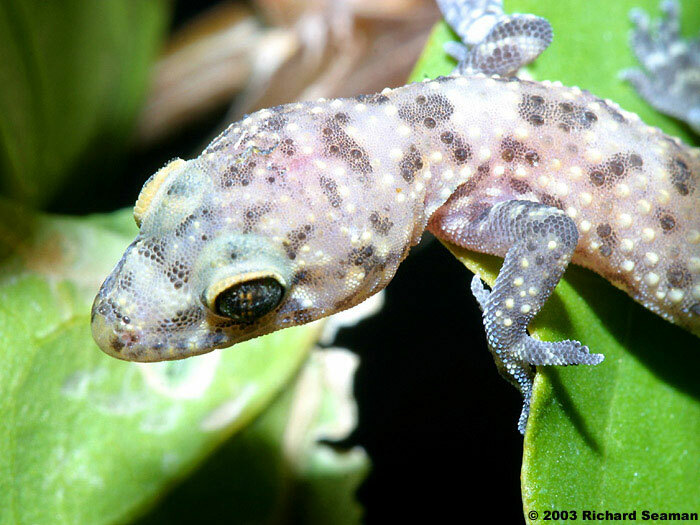 Mediterranean Geckos have specialized toe pads that let them climb and hang on to almost any surface. 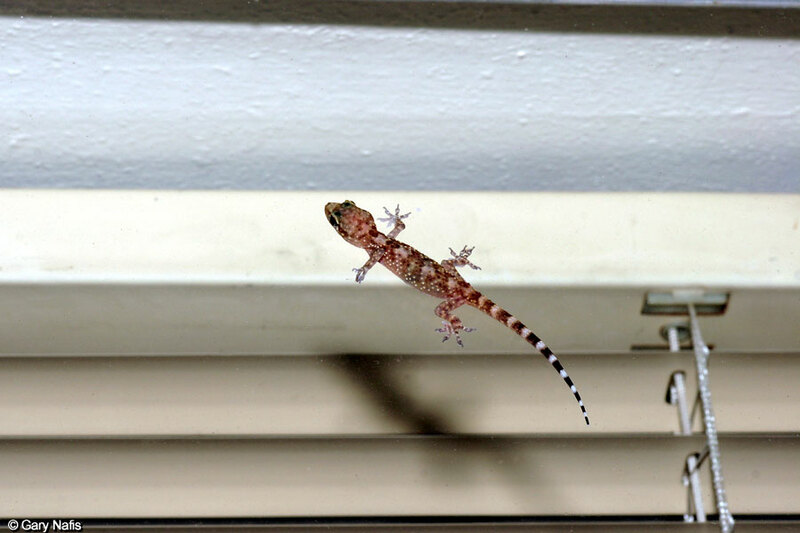 Juvenile climbing on a glass window. The six pictures directly above all show the same large adult gecko found in Travis County, Texas. The gecko was dark in color when I found it underneath a large limestone rock that was covered with ice after an ice storm. I brought the gecko inside and took the pictures in its dark phase shown above in the top row. It warmed up after a few minutes and lightened in color and I took the pictures in the bottom row. 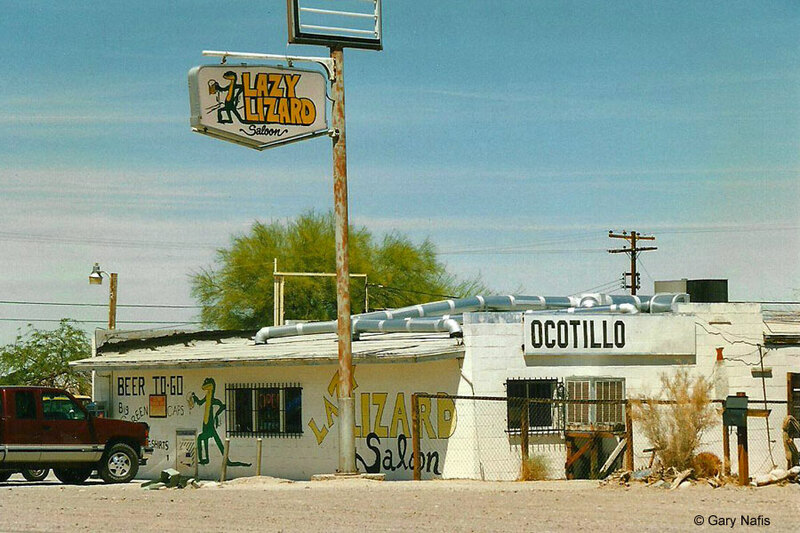 Ocotillo, Imperial County, home of the Lazy Lizard Saloon. 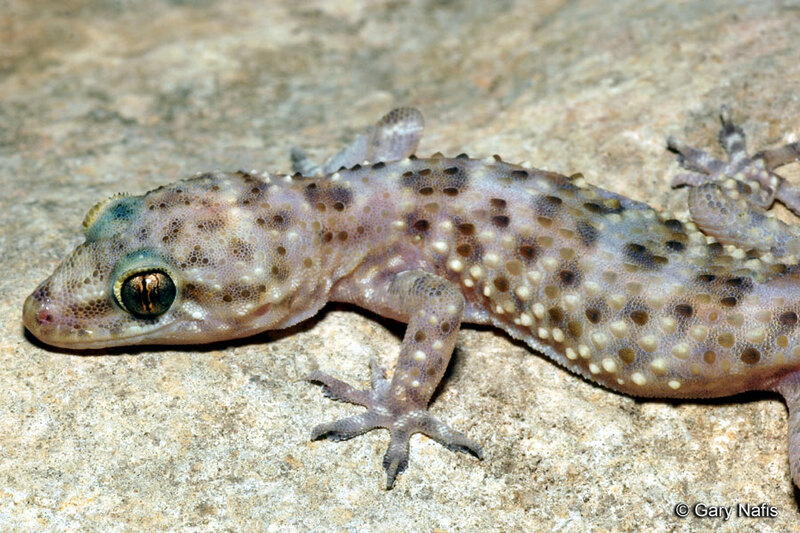 Mediterranean Geckos have been found in several locations in the Coachella Valley in Riverside County, including Desert Hot Springs, Rancho Mirage, and Palm Springs. 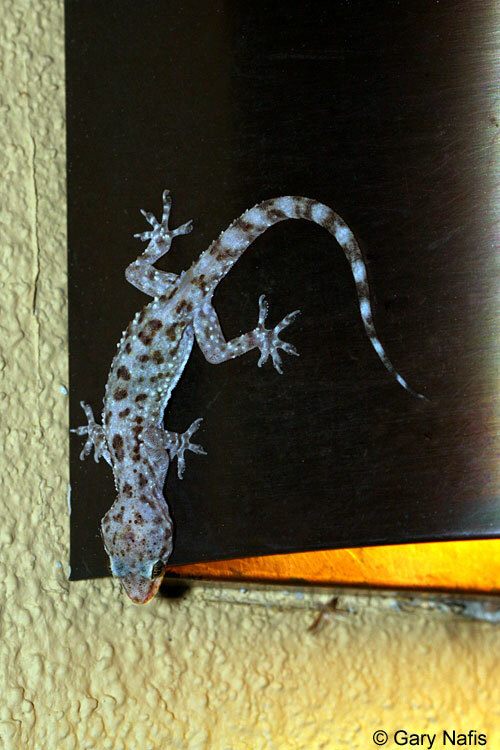 Here you can see several geckos gathered under an outdoor light on the wall of a Palm Springs motel. © 2005 William Flaxington These geckos been spreading up the Central Valley along the Highway 99 corridor in cities including Bakersfield, Fresno, Kingsburg, and Chowchilla. 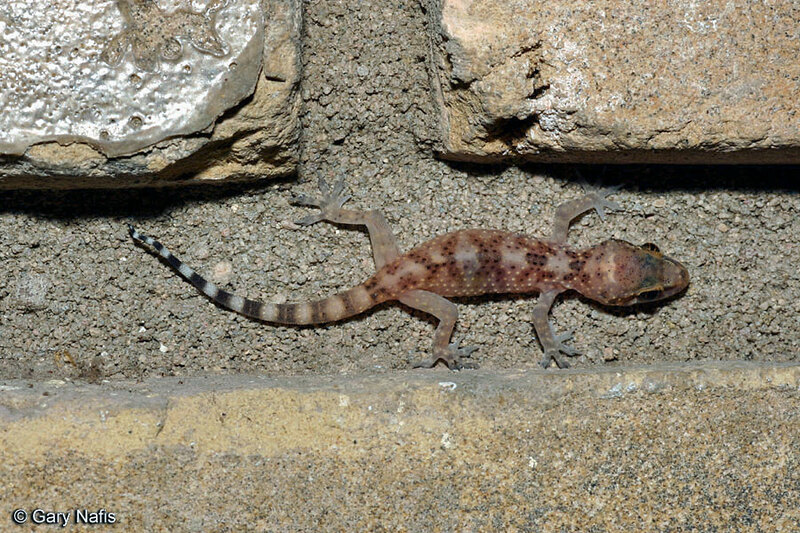 Mediterranean Geckos have been found in several locations in the Imperial Valley, Imperial County, including Imperial, El Centro and Calexico. 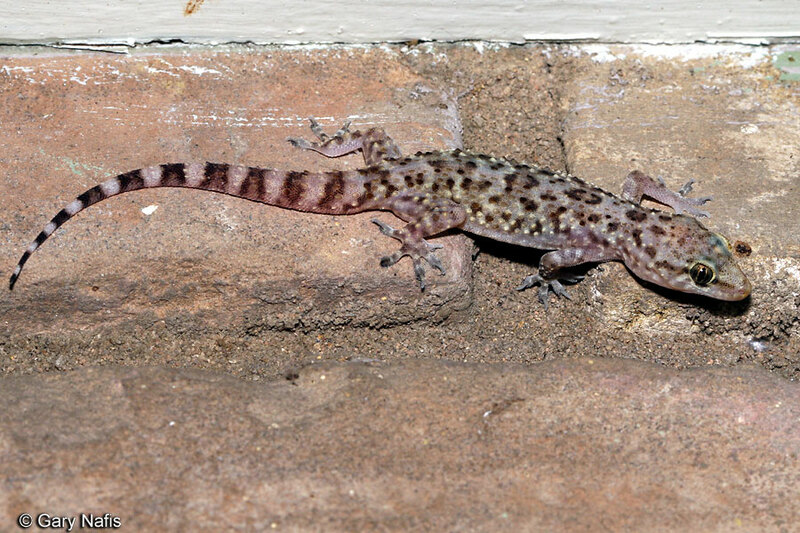 And adult and a juvenile Mediterranean Gecko run around at night on a white exterior wall in Imperial County An adult Mediterranean Gecko licks its lips on an exterior wall in Yuma, Arizona. 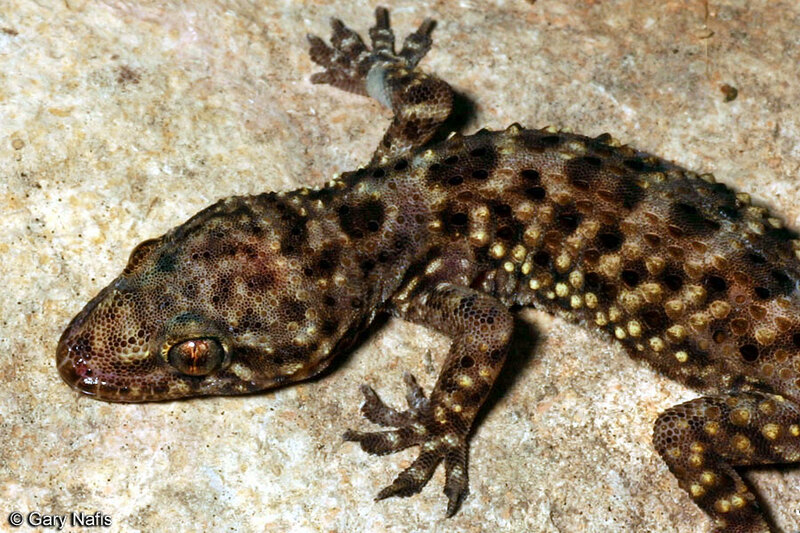 A small, slightly flattened gecko with conspicuous large bumpy tubercles on the skin. Eyes are large with no lids and vertical pupils. The toes have broad pads with claws extending beyond them and no webbing. The tail is round and ringed with dark and light bands. It will grow back if it is broken off. with dark blotching and spotting sometimes forming indistinct bands. Juveniles have more prominent light and dark tail banding than adults. Males make mouselike squeaking sounds during fights and probably to claim their territory. Males also make a series of clicking sounds to advertise their presence to females during the breeding season. 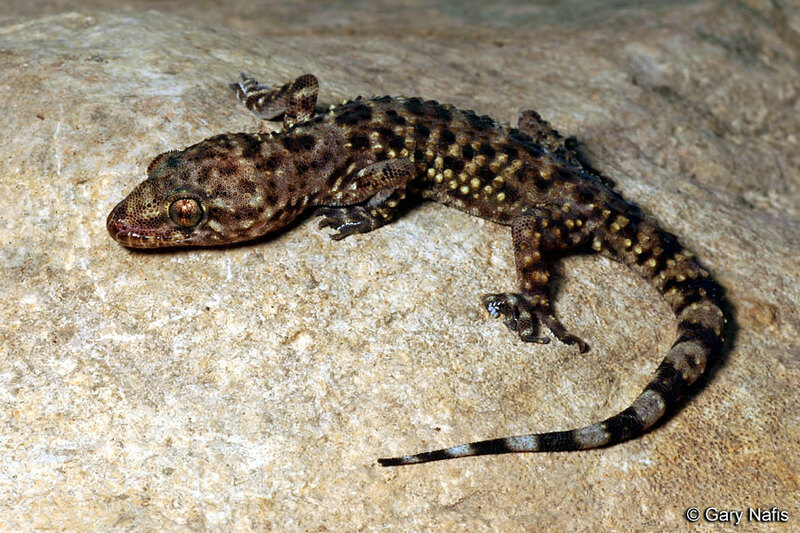 The best way to differentiate these two species is the skin: the Indo-Pacific Gecko has smooth skin, while the Mediterranean Gecko has conspicuous large bumpy tubercles on the skin. 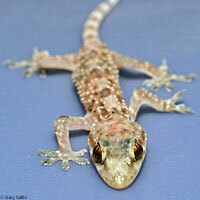 The Indo-Pacific Gecko also has a yellow belly while that of the Mediterranean gecko is pale but not yellow. Often seen sitting motionless at night under lights on the exterior walls of buildings where they are waiting to feed on insects attracted to the light. Also seen on walls and ceilings stalking insects. When approached too closely, they will run into a nearby shelter. The tail can be broken off as a survival strategy to distract a predator and it will grow back. Active all year long, but more active when temperatures are hot. 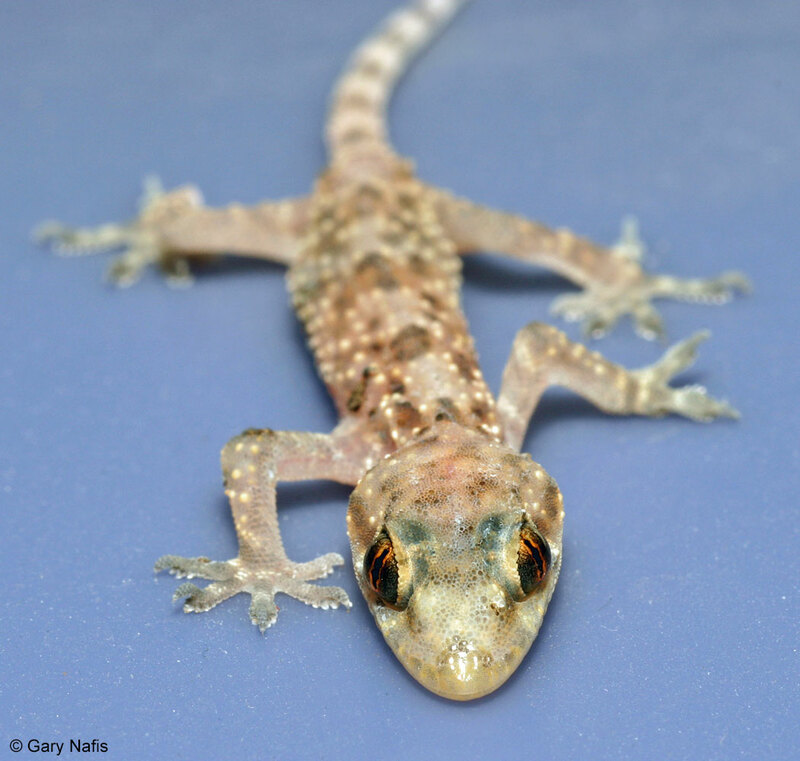 These geckos appear to prefer hot climates in regions with short, mild winters, although they are apparently established in places with cold winters including Baltimore and Oklahoma. (Locey & Stone 2006) They are definitely capable of surviving short periods of freezing temperatures - I witnessed a population of these geckos survive a severe ice storm with freezing temperatures lasting for several days in January 2006 in Austin Texas, including one large adult found surviving under a large rock that was completely covered with ice along with the ground around it. Males are territorial and will defend good hunting areas. A variety of small invertebrates. Mates from March to July. These geckos are sexually mature in a year or less. Females lay 1 - 2 calcereous eggs in communal clutches 1 - 3 times per year from April to August. When present, eggs can be seen under the translucent belly skin of females. Urbanized - often living in or near human dwellings. Often seen at night under lights on the exterior walls of buildings. In the daytime I have seen them sheltering under house shingles, cracks between bricks, under outside wall lamps, and under rocks, downed wood, and planters in the yard, and in and under boxes in the garage. They can also be found under palm fronds, and other surface objects such as rocks, wood, and tin, and in crevices in rocks and holes in trees. At one rural location in Travis county near the ruins of some old buildings we found many of them under stacks of old roofing tin. Native to the Mediterranean area, Africa, and the Middle East region. 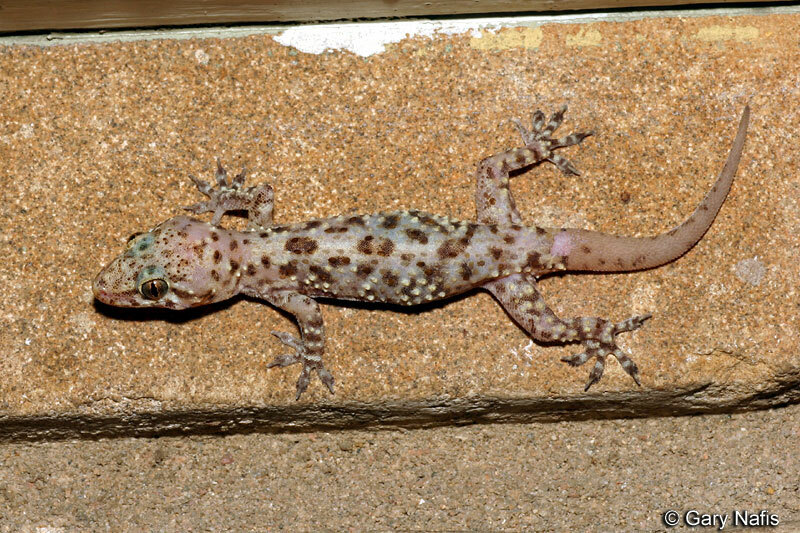 Reported in the United States in 1955 in Brownsville Texas, (and 1910 in the Florida Keys) this gecko has spread rapidly, and is established in the United States in Alabama, Arizona, Arkansas, California, Florida, Georgia, Illinois, Kansas, Louisiana, Maryland, Mississippi, Missouri, Nevada, New Mexico, North Carolina, Oklahoma, South Carolina, Texas, Utah, and Virginia, and in a large part of eastern Mexico, including the Yucatan Peninsula. Most likely also introduced into Baja California. Introduced into Panama, Cuba, Puerto Rico, and possibly Belize. The earliest museum record documenting Mediterranean Geckos in California I can find is from Ocotillo in Imperial County in 1988, though it's possible they were established before then either in Ocotillo or somewhere else. Below is a list of the locations that I have heard about where Mediterranean Geckos have been found in California since I started keeping track of them in 2010. I'm sure there are more locations that I don't know about. Most of these locations come from visitors to this web site who emailed me to tell me that they found them. Others come from museum records or other published records. Mediterranean Geckos may not be established in all of the areas listed here and shown on the map. 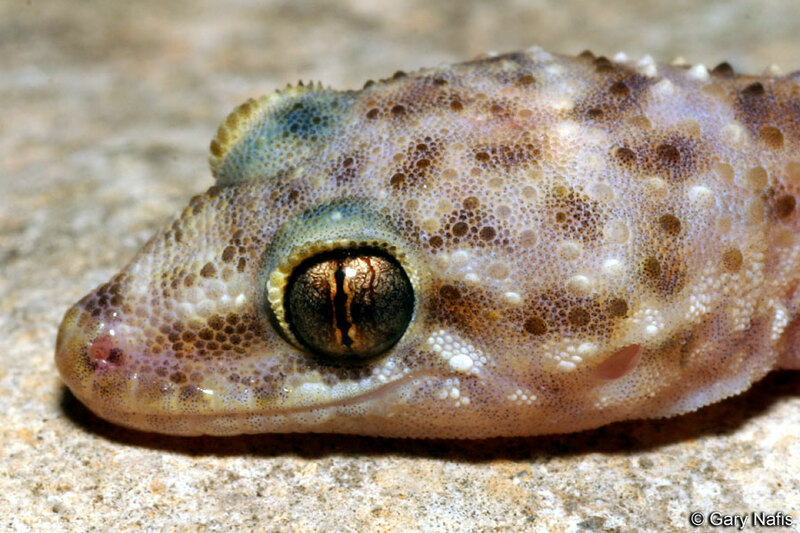 A single lizard might be solitary or it might be a member of a population that was temporarily established but did not survive one or more winters or other environmental stress, but it is most likely that there are many geckos at every location listed. There were only a few locations listed in 2010, but the numbers of locations have grown rapidly and continue to do so. I will continue to add locations here and on the map as I hear of them. If you see any or know of any locations not on this list, please email me. Recently introduced into California, this successful stowaway is expanding its range, although low winter temperatures in some areas will probably restrain them to the warmer parts of the state. 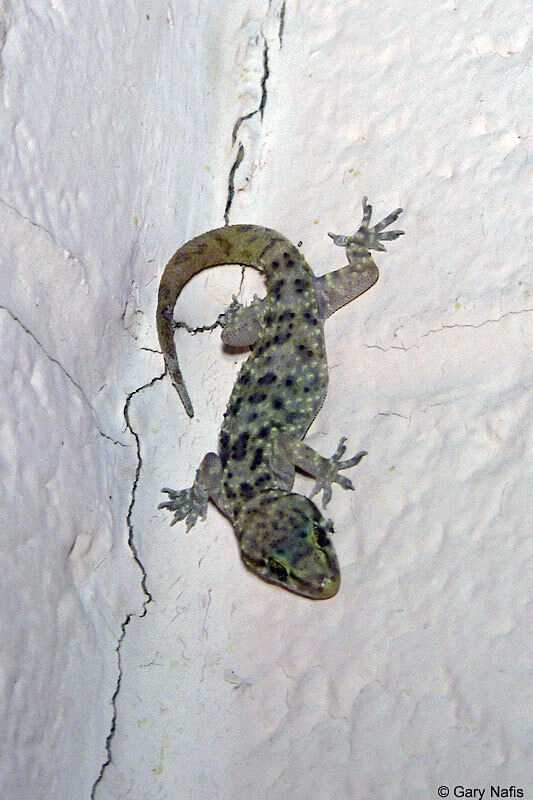 Unlike some alien species in the state, introduced Mediterranean Geckos are not the result of released or escaped pets. 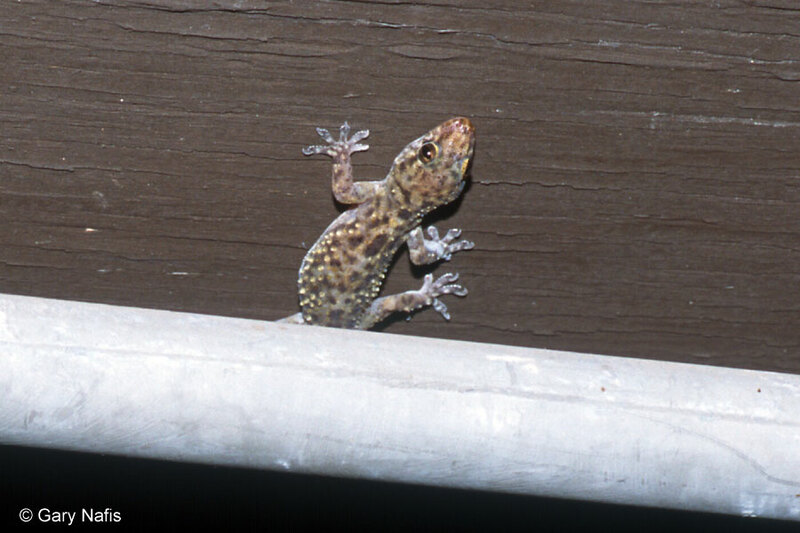 The most likely reason for the rapid spread of this gecko is the accidental transport of geckos and their eggs hiding in lumber and other commercial products on trucks, cars, trains, etc., from areas where the geckos have become established, originally the Southeastern part of the US, but now also Southern California. 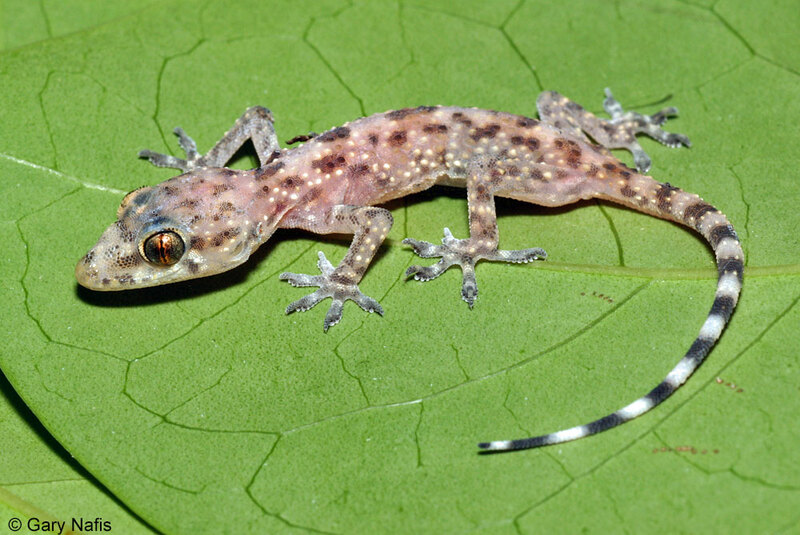 One gravid gecko, or one egg mass could be responsible for the establishment of this gecko species in a new location. For example, I was asked to identify a Mediterranean Gecko that was found in Manitoba, Canada in a shipment of pipes from Texas. 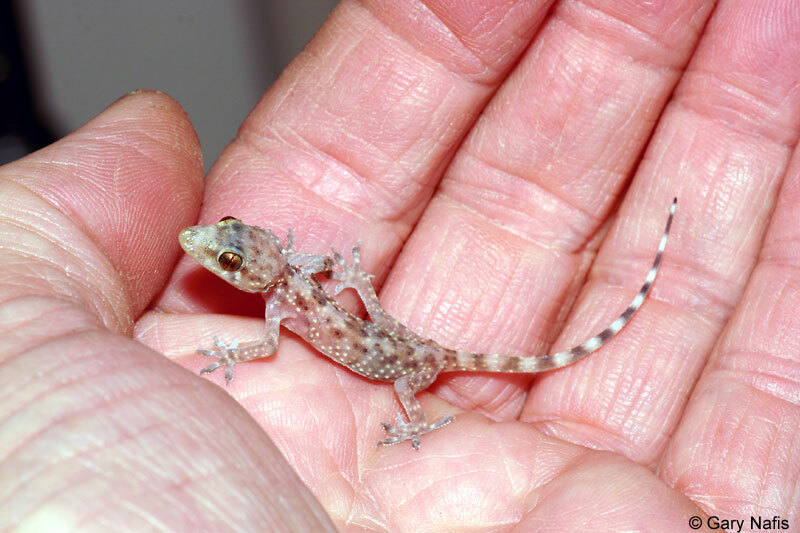 People have also told me that they found geckos at their new houses in California shortly after shipping their belongings from Texas and from Florida. 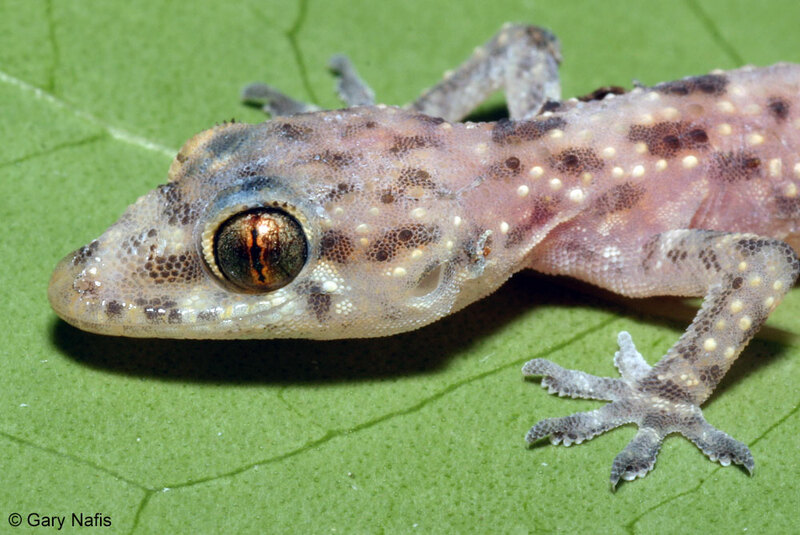 I have not seen any studies that describe any possible threat to native species by this invasive gecko. turcicus - Latin, meaning "from Turkey"
Garrett, Judith M. and David G. Barker. A Field Guide to Reptiles and Amphibians of Texas. Gulf Publishing Company, Houston Texas, 1987. There are no significant conservation concerns for this non-native animal in California.